Growing up my favorite elementary school lunch was Salisbury steaks. It consisted of a hamburger gravy slathered in beef gravy, a scoop of instant mashed potatoes, a vegetable, and a fruit cup. I loved it and bought it every time it was on the menu. Between that and pizza day those were the only times I was allowed to buy school lunch. I distinctly remember that being my parents rule; however, my mom tells me that was not the case–I was just very picky and those were the only meals I would eat from the cafeteria. Just recently I’ve had the hankering for Salisbury steak. So after a little research and lots of testing (5+ times)… I finally have a delicious go-to Salisbury steak recipe! I’ve made it both ways with homemade gravy and store bought. We like both ways and it’s all based on preference. Going the store bought route will only trim off 5 minutes from the cooking time. If you go the store bought route I found that a large jar of Heinz beef gravy worked best. And it makes it tastes pretty homemade thanks to the caramelized onions that you cook before placing the “steaks” in the pan. It’s also key to not overcrowd the pan. I love this new OXO jumbo sauté pan. It’s huge and best of all very lightweight! And all of the “steaks” fit in comfortably with plenty of room to cook. Another tip I have to share about the steaks… Cook them one minute and then flip and squish down with the back of a flat spatula. I think a thinner steak is key in achieving that lunchroom like consistency. 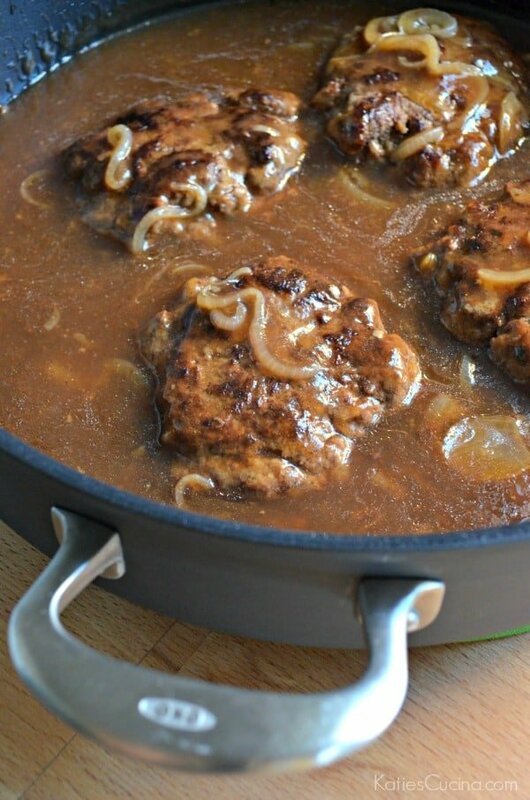 So if your craving Salisbury Steak this is the recipe you need to make! In a large skillet, heat the butter on high. Melt butter and add in thinly sliced onions. Reduce heat to medium, stir well and add in 1/4 cup of the beef broth. Place the lid on and let cook for 5 minutes. Mixing occasionally--making sure that the onions do not burn. We will sweat the onions out. Once the onions are translucent remove them from the pan. While the onions cook prepare the ground beef mixture. Combine the ground beef, steak seasoning, 1 tablespoon of Worcestershire sauce, dried onion flakes, parsley, bread crumbs and egg together. Mix well, then divide the mixture into 4-6 patties. Add in the grapeseed oil to the pan. Form each pattie into an oval shape, pressing thin, then place in the skillet. Cook for 5 minutes on medium heat with the lid on. Then flip the patties with a spatula and press the beef down thinning them out. Cook for an additional 3 minutes, then remove from the skillet. Add the onions back in the skillet, and cook for 1 minute. While onions are cooking mix together the 3 cups of beef broth, 2 tablespoon Worcestershire sauce, 3 tablespoons cornstarch, and black pepper. Mix the broth into the skillet and put the heat up to high. Cook for 3-4 minutes stirring constantly until broth turns into gravy. Then add in the beef, make sure gravy is on top of the beef and cook for an additional 5 minutes on low (with lid on). Serve immediately and enjoy. Disclaimer: There are affiliate links in this post. If you click on the link and purchase I will make a percentage of the sale. 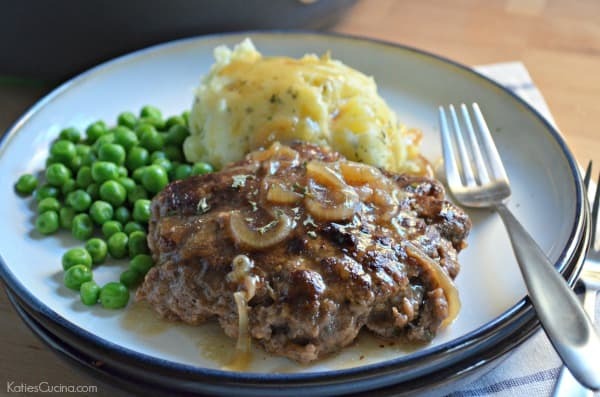 Its been years since I have had salisbury steak – I would love to try a homemade version. Me too until recently. Now I’m finding I’m making it every other week! So easy and so good! I just made this again last night for dinner. It’s always a hit in our house! My toddler eats an entire beef patty! Made this tonight and it was wonderful. I had leftover fresh sliced mushrooms, so I sauteed them with the onion. This was such an easy recipe. I really like the addition of steak seasoning to the meat. I think this recipe will replace my usual recipe. My husband loved it. Thanks !! Bobbie–so glad to read that your family loved this recipe! This is one of my go-to recipes I’m constantly making at our house–always a crowd pleaser! 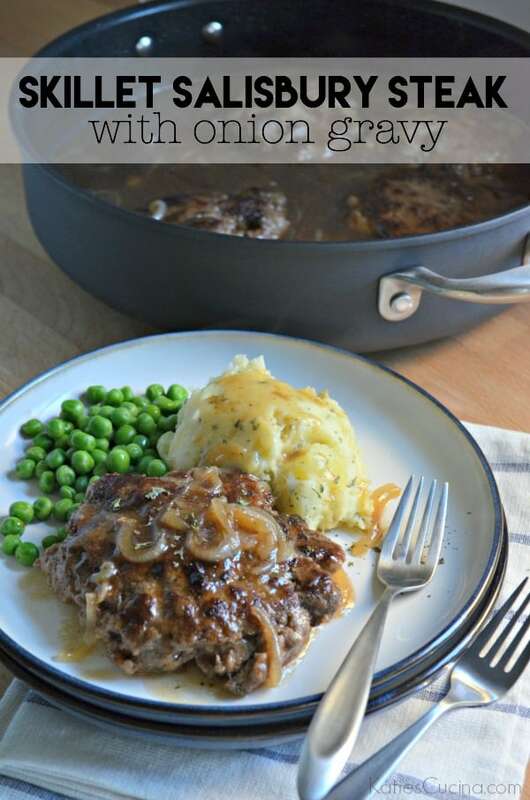 I’m going to make this tonight, because been long time since had Salisbury steak, but have a question: In ingredients say 2-1/4 cups of beef broth, but in directions says 3 cups for the gravy, Which is it? Hi Tom, sorry about that typo! It should have read 3-1/2 cups, divided. Hope you enjoyed this recipe. It’s a family favorite and actually on my menu for the end of this week!